Tulip and muscari bulbs are a pretty combo. 1. 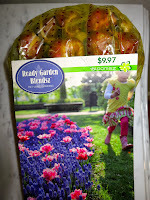 Chose large, firm, unblemished bulbs from a reputable garden center or mail-order nursery. Narcissus (paperwhite or daffodil), amaryllis, tulip, crocus, and hyacinth are good choices to start with. 2. Identify clean clay, glass, ceramic, or plastic containers that are at least twice as deep as the bulbs. 3. Bulbs contain all the food they need to support the young bud. However, a good potting mix will help maintain proper moisture. Purchase a pre-mixed soil, or build your own using three parts well-rotted compost, two parts peat or peat alternative, and one part sand. Bulbs may also be planted amongst small stones, marbles or other decorative material. 4. Fill pots half-full with planting medium. 5. 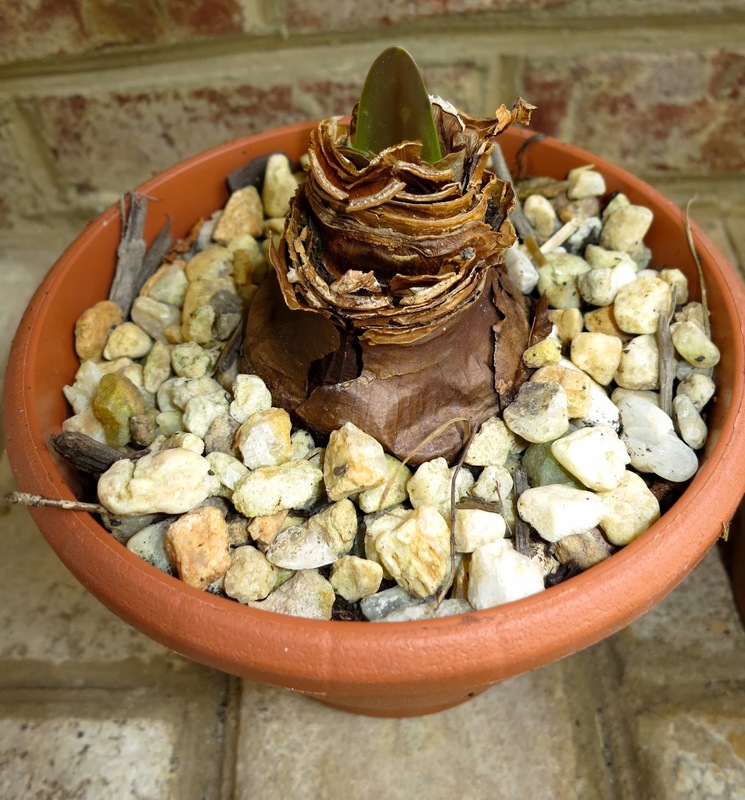 Place the bulb in the planting medium with the tip pointing up (or on its side if you can't tell which end is the tip), and fill to cover the lower two-thirds of the bulb. The tip should be visible. 6. Different bulbs may be combined for a colorful display. Grape hyacinth and daffodil are a classic combination. 7. Water lightly, ensuring that the bulb is not sitting in water. Keep the soil or other medium consistently moist, so that roots have access to water at all times. 8. Bulbs need a cold period in order to bloom. 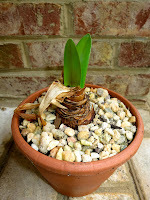 Place the potted bulbs in a protected area with temperatures between 40 - 45 degrees for 12-16 weeks. Do not allow bulbs to freeze. They can be chilled in the refrigerator (away from apples), in a cold basement, or in an outdoor trench. Keep soil evenly moist. Roots and shoots should be visible after 12 weeks or so. 9. Here's the fun part - we're going to "trick" the bulbs into thinking it's spring. Move them to a moderately sunny location where the temperature is 50-60 degrees. When buds turn green, after a few days, move the containers to a bright location with a temperature between 60-70 degrees. 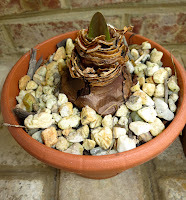 Bulbs will bloom within 2-3 weeks. 10. Most forced bulbs are discarded after blooming. However, daffodils will re-bloom if planted outdoors, and amayrillis can be stored and forced from year to year. To save bulbs, remove flowers after they bloom and reduce water until foliage turns yellow. 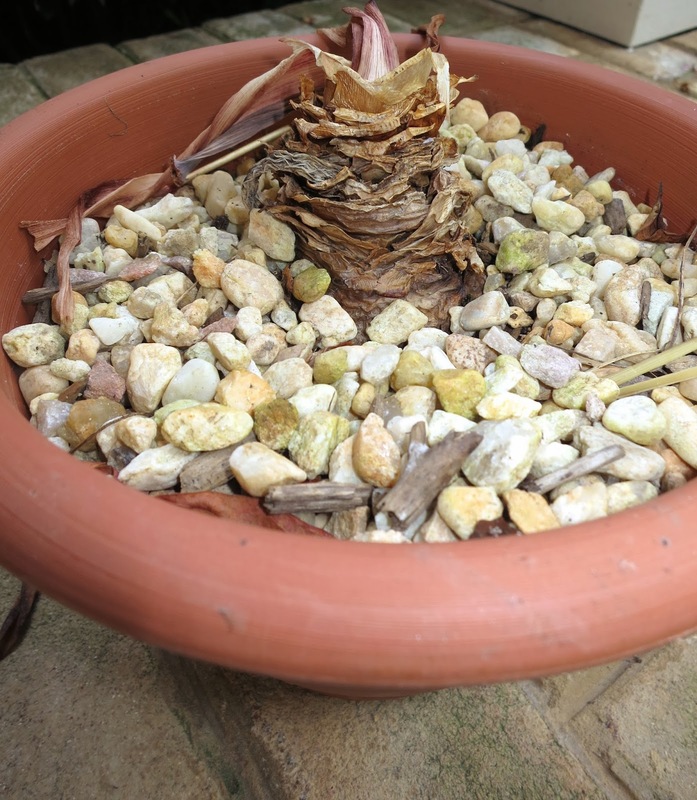 Trim remaining foliage, remove bulbs from soil, and store in a cool, dry location until next fall.